A beautiful look inside the classroom Max attends via BEAM telepresence robot. Max was born in August of 2013, weighing in at a healthy nine pounds, two ounces. After a two day stay in the hospital, we went home and began our happy new life as a family of three. 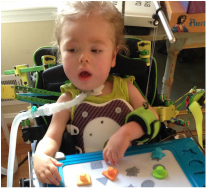 Help Max and others reach their full potential with assistive technologies, therapies, home modifications, and more.